The Global Volcanism Program has no activity reports for Ambre-Bobaomby. The Global Volcanism Program has no Weekly Reports available for Ambre-Bobaomby. The Global Volcanism Program has no Bulletin Reports available for Ambre-Bobaomby. The Ambre-Bobaomby volcanic field at the N tip of Madagascar consists of Miocene volcanics capped by very recent cones. The earliest volcanism produced a large basaltic massif and minor pyroclastic flows. The Tertiary to Quaternary volcanic rocks span a wide geochemical spectrum, including basaltic, andesitic, rhyolitic, trachytic, phonolitic, and foiditic compositions. The young volcanoes have very well-preserved morphologies and were mapped as Recent (Besairie, 1973). Other very recent cones are located at the S end of the massif, and crater lakes are also present. The Global Volcanism Program is not aware of any Holocene eruptions from Ambre-Bobaomby. If this volcano has had large eruptions (VEI >= 4) prior to 10,000 years ago, information might be found on the Ambre-Bobaomby page in the LaMEVE (Large Magnitude Explosive Volcanic Eruptions) database, a part of the Volcano Global Risk Identification and Analysis Project (VOGRIPA). There is no Deformation History data available for Ambre-Bobaomby. There is no Emissions History data available for Ambre-Bobaomby. The cloud-covered area left of center is the Ambre volcanic massif. The broad Ambre-Bobaomby volcanic field extends from near the eastern coast (bottom) to include the Orontany Peninsula at the upper right. 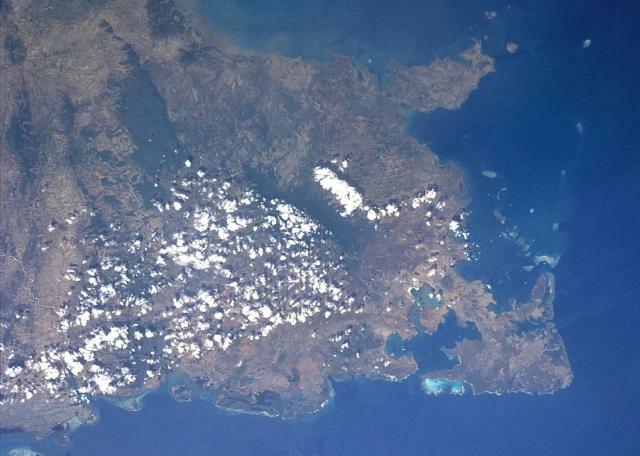 The north-pointing, arrow-shaped Cape Ambre peninsula forming the extreme northern tip of Madagascar lies at the lower right in this Space Shuttle view. The Ambre-Bobaomby volcanic field consists of Miocene volcanics capped by very recent cones and crater lakes. NASA Space Shuttle image STS103-732-41, 1999 (http://eol.jsc.nasa.gov/). There are no samples for Ambre-Bobaomby in the Smithsonian's NMNH Department of Mineral Sciences Rock and Ore collection. Large Eruptions of Ambre-Bobaomby Information about large Quaternary eruptions (VEI >= 4) is cataloged in the Large Magnitude Explosive Volcanic Eruptions (LaMEVE) database of the Volcano Global Risk Identification and Analysis Project (VOGRIPA).